On this 12-day Ladakh motorbiking adventure, you'll begin from Delhi and visit the famed lakes of Pangong and Tso Moriri, travel to the sand dunes of Hunder, ride through the high-altitude pass of Khardung-La, visit the historic monasteries of Thiksey and Diskit, apart from a range of other exciting adventures. A major highlight of this itinerary, you'll also visit the distant village of Hanle, near the Indo-Tibetan border. Ladakh, the land of high mountain passes, is also the land of extraordinary beauty. The Ladakhi terrain, flanked by the towering mountains of the Trans-Himalayan range, with snow-capped summits rising far beyond the clouds, is home to one of the most iconic motorbiking routes in the country. With scenic views of the landscape, painted in differing shades of grey and brown, you'll explore faraway villages and secluded landmarks in the region on a 12-day motorbiking itinerary. Arrive in Delhi and convene at a pre-determined meeting point. In the afternoon, you'll meet your fellow motorbikers and your road captain for a brief orientation session to discuss the climate conditions, itinerary and other details of your upcoming motorbiking adventure. In the evening, you'll board a Volvo bus from Delhi and settle in for an overnight journey to Manali. Overnight in transit. Arrive in Manali by early morning and spend the day at leisure. You can visit the local marketplace to shop for any last minute essentials or visit local attractions in Manali such as the Manali Mall road or the Hadimba Temple. Overnight in a hotel at Manali. Begin your Ladakh motorbiking adventure from the charming woods near Manali, featuring thick forests of oak and pine. Travelling away from the lush, green valleys of Manali, you'll begin riding towards the barren hills of Ladakh. You'll ride through the Rohtang Pass, a famous mountain pass in Himachal Pradesh, and drive alongside the flowing Beas River. Overnight in Swiss tents at Sarchu. 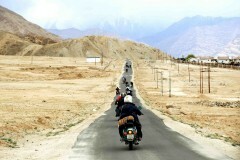 Ride from Sarchu to Leh, the largest city of Ladakh. En route, you'll cross the More Plains, a vast stretch of flat land with breathtaking views on the horizon. You'll also ride through the challenging Gata Loops, a series of hairpin bends that require attentive motorbiking skills. Also on today's itinerary is riding through the second highest mountain pass in the world, the Tanglang-La. Overnight in a hotel in Leh. Arrive in Delhi. You'll spend the night travelling from Delhi to Manali in a Volvo bus. No meals are included in today's package but you can visit any of the restaurants in Delhi to have meals at your own expense. Arrive in Manali. You'll be accommodated in a hotel at Manali. Today's meal package includes dinner only. In the evening, you can visit the local marketplace in Manali to shop for any last minute essentials. 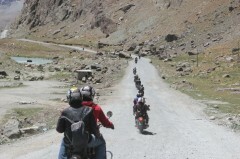 Ride from Manali to Sarchu. You'll be accommodated in Swiss tents at Sarchu. Today's meal package includes breakfast and dinner only. Please remember to carry spare cash for personal and incidental expenses, and a govt-issued ID card apart from a valid driver's license with you. 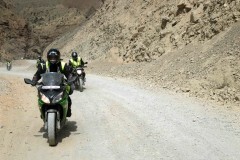 Ride from Sarchu to Leh. You'll be accommodated in a hotel at Leh. Today's meal package includes breakfast and dinner only. Please note that non-vegetarian dishes may not be available during all meals. Ride from Tso Moriri to Leh. You'll be accommodated in a hotel at Leh. Today's meal package includes breakfast and dinner only. Return your allotted motorbikes at Leh. Delhi is accessible via road, rail and air. You can board a direct flight to Delhi's Indira Gandhi International Airport from most major cities in India. You'll board a Volvo bus from Delhi and travel to Manali, the start point of your Ladakh motorbiking adventure. 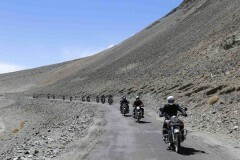 The tour operator will arrange your transport to the start point of the Ladakh motorbiking trip.